Calcs-Plus provides turnkey residential services ranging from providing code compliance forms (room by room load and energy code calculations) for the permitting process to financial analysis and improvements consultation up to final certification (Energy Star or field testing & Home Commissioning). • Fact #1: The standards of the Florida Energy Efficiency Code for Building Construction represent the worst buildings allowed by law to be built in Florida. • Fact #3: The Florida Energy Code has not changed substantively since 1985. The result is that homes built today can draw from 14 years of technology improvements and must be significantly more efficient than Florida Energy Code requirements if their cost effectiveness is to be optimized. • Fact #4: The price of a home considers only what you must pay to purchase the home (the mortgage costs). Home owners, however, must consider the total cost of ownership, which includes both the "price" as well as what must be paid to live in the home (the operating costs). Most people don't realize it but, on average, a typical Florida home owner will pay more than $50,000 to provide the energy for a small, code-complaint Florida home over the course of the mortgage. 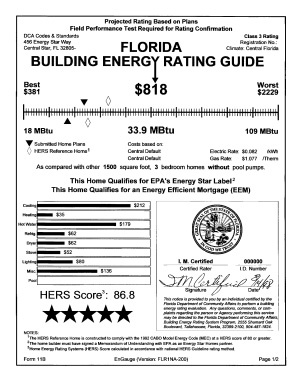 • Fact #5: The only reasonable means of accurately determining the relative energy efficiency and the total costs for a home is through an Energy Rating using the Florida Energy Gauge Program -- remember, Florida's Energy Code is a pass/fail minimum standard. Most homes, new or existing, can be substantially improved and return money to their owner from day one! The chart below illustrates how these savings occur, even in proposed new, "code-compliant" homes. As you improve the efficiency of a new home, the present value of its "price" (mortgage cost) increases - more and more rapidly as you approach the best available technology. Simultaneously, however, the operating cost (energy cost) decreases. 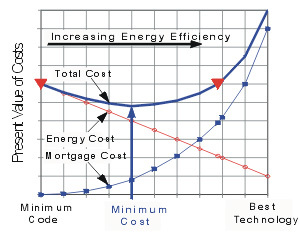 There is a point, which is much more energy efficient than Minimum Code, at which the sum of the mortgage and energy cost (total cost) is minimized. This point is labeled on the horizontal axis of chart as Minimum Cost with an arrow pointing to the lowest point on the total cost curve. It is worth noting that the cost of owning the minimum code home is greater than the cost of owning a more energy efficient home until the point indicated by the large triangle on the right side of the total cost curve is reached. Thus, substantial improvements in efficiency (and quality and comfort) are typically very cost-effective. This example illustrates the operating principal of ENERGYGAUGE Pro's optimization feature, whereby the present values of the mortgage costs are balanced against the present value of the energy savings and only the most cost-effective improvements are incorporated into the home. Now, for the first time in Florida, there is a uniform, "expert system" in place that can measure and report on the economic and financial impacts of home energy technology decisions. Certified Florida Raters are equipped with these energy analysis and evaluation tools, and for an investment of only a few hundred dollars, you can save thousands of dollars on your home purchase, new or existing. And you can take it to the bank! There are increasing numbers of mortgage bankers offering Energy Efficient Mortgages (EEMs) and utility and government programs that are "honoring" the energy savings projected by certified home energy rating systems. Tools like ENERGYGAUGE in the hands of Certified Raters now make this a feasible alternative for Florida home owners and buyers. And to ensure mortgage industry accreditation, misrepresentation of the ENERGYGAUGE results has been made purposely difficult through a policy of full disclosure. Each of the user-selected economic and financial assumptions and each improvement along with its cost, its cost basis (source), its lifetime and any other associated costs or benefits are clearly printed on the output reports. This is done to ensure that financial results are properly interpreted and, if necessary, can be fully replicated. • Home buyers can literally get more home for less money by taking advantage of the operating cost savings of improved energy efficiency. They also will get a higher-quality, more comfortable home. • Home owners can increase their equity and cash flow positions and achieve a greater market value for their property at the time of sale. • Home builders can achieve greater profitability through the sale of higher quality buildings, reductions in "call backs" and improved customer satisfaction. • Realtors can close more sales, more quickly by using the expanded market and qualifying power of Energy Efficient Mortgage underwriting and financial institution incentive programs. • Lenders can increase their share of the mortgage market and simultaneously lower their default risk as a result of the improved cash flow position of borrowers. • Florida (and the Nation) can achieve positive economic impacts through increased jobs and attain greater economic and environmental sustainability through reductions in energy use and air pollution. 1. Florida Power and Light Company, New Home Construction Research Project Findings, Results & Recommendations, Final Report, Exhibit 25, Report to the Florida Public Service Commission, Tallahassee, FL, June 1, 1995. Question: How much does an Energy Rating save me on my electric bill? Answer: Nothing. An Energy Rating is a report that is one of the predictors of the energy uses in your house. The true indicator of the energy efficiency of your house is your monthly electric bill. It is hoped that since an Energy Rating has been performed, awareness and implementation of more energy efficient practices have occurred during construction. Question: What is the difference between a Duct Smoke Test and an Energy Rating? 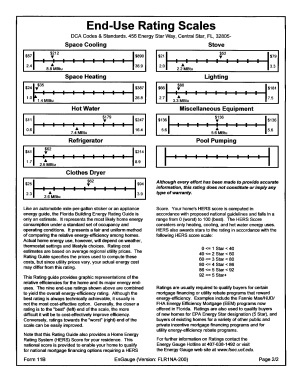 Answer: An Energy Rating is a quantitative report that contains as one of the inputs, a duct leakage number. A Smoke Test is a visual method to identify and correct failures in the duct system, without the need to quantify a number. That number will be lower if measured later for an Energy Rating. An Energy Rating tells "how much" with measuring instruments. A Duct Smoke Test tells visually "how much" in addition to "where". Question: Is Calcs-Plus a mold remediator? Answer: No, Calcs-Plus services regarding mold is to diagnose the Building conditions and analyze the reasons why the mold is present for preventative purposes. Unless those conditions are understood and rectified, there is a high probability that the mold will return. Mold remediators collect samples, identify the mold type, determine the concentrations and sanitize the affected area. Question: I have just purchased an "Energy Star" labeled home? Does that mean it has been certified and tested? Answer: No, your house may have been "sampled" under one of EPA's policies. If your house has been sampled, only 1 out of 7 houses in your subdivision may have been actually inspected and tested! Question: How do I know if my house was sampled or rated? Question: Regardless if my house was tested, EPA has assured that my Energy Star House will be at least 30% more efficient than a similarly built house. Is this correct? Answer: No, unless the house was tested and verified, there is no assurance. Some of EPA's protocols do not even meet minimum Florida energy code requirements (specifically Building Option Packages)! Also, how do you know if your home is energy-efficient it if has never been tested and verified?